Wow. November 7, 1987 - - the world was off its axis! 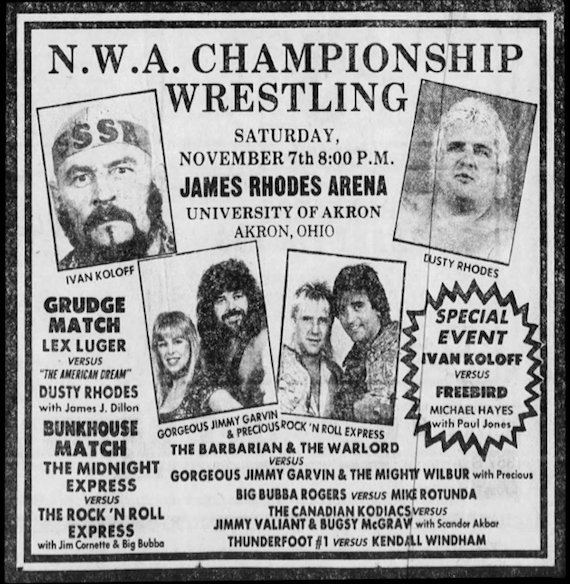 Or maybe it was just a severe case of confusion by the person at the newspaper who put this ad together for Jim Crockett Promotions. Dusty Rhodes with .... James J. Dillon? The Rock & Roll Express with .... Jim Cornette? 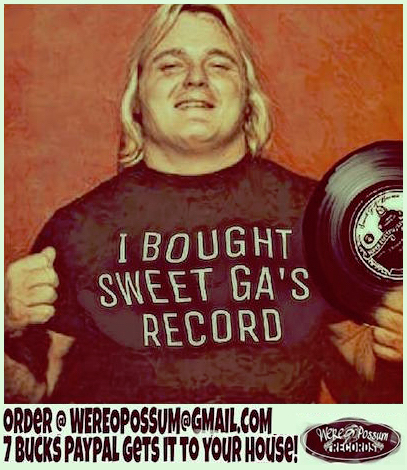 Freebird Michael Hayes with .... Paul Jones? Jimmy Valiant and Bugsy McGraw with .... Skandor Akbar? The Mighty Wilbur with .... Precious? Whew! Can you imagine the confusion for some young kid seeing that in the paper before going to the big show at James Rhodes Arena? Thanks to Mark Eastridge for sending us this funny ad. By the end of July 1977 with the result of their feud hanging in the balance, Igor and Superstar entered a new and dangerous phase of their bitter rivalry that went on into the month of August through and until the last week of September. 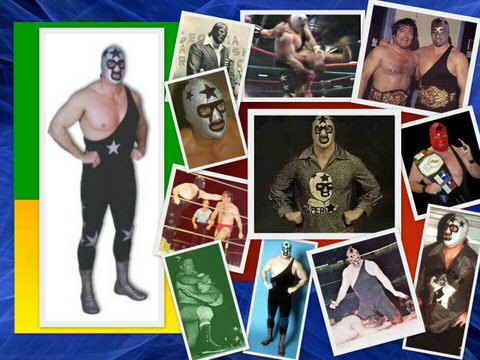 At the urging of the “Mad Russian” Boris Malenko, vicious Russian Chain matches were scheduled between Igor and Superstar, the first of which occurred on July 26th in Columbia, South Carolina. 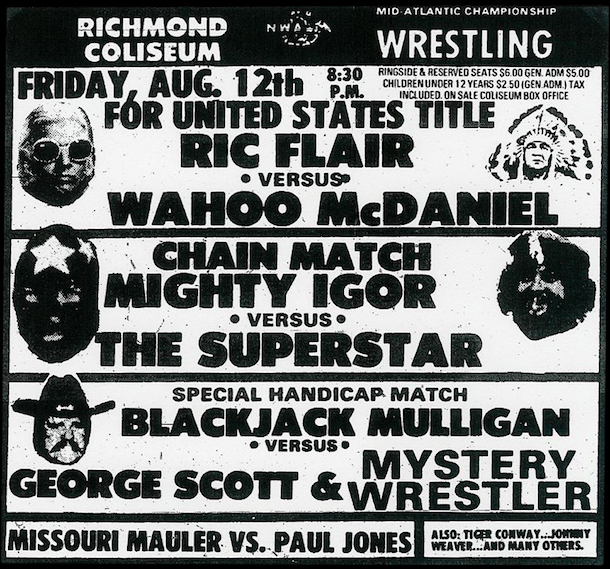 In addition to the Russian Chain matches, Lumberjack matches between the two adversaries were also set, the first of which occurred on August 9, 1977 in Raleigh. Despite the natural advantage Superstar seemed to have with Malenko in his corner for the Russian Chain matches, Igor prevailed in the vast majority of these bruising battles with the steel chain in August and much of September. Because there was no pinfall or submission possible in this type of bout, the Superstar maintained his mask and $5,000.00 despite losing most of these contests. However, in the Lumberjack matches that were held during that very same time frame, the Superstar came out the victor in a high percentage of them. Thus, when the 1977 calendar hit the last week in September the winner of this epic feud was very much still in doubt. The colossal program between the Superstar and Igor that began in the frigid cold of February 1977 would reach its end in the crisp fall air of late September. During the last week of September, the Superstar defeated Igor in brutal fence matches (starting to be called cage matches) in Roanoke, Virginia on September 25th, and in Rocky Mount, North Carolina on September 28th. Also during that last week of September, the masked man punished Igor in Charlotte, North Carolina and Fishersville, Virginia in two bloodbaths of matches. That led to a fence match in Richmond, Virginia on Friday night, September 30th. This would be the last match ever between these two arch-enemies. 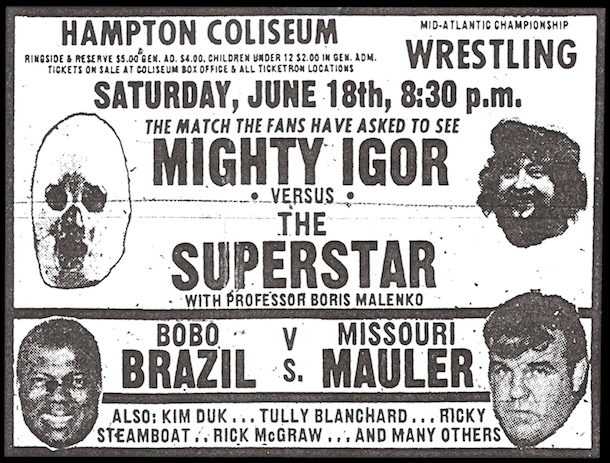 The climactic match in Richmond between Superstar and Igor certainly lived up to the hype. Eight months of animosity between these two seemed to all come out within the confines of the unforgiving cage. The steel was used as a weapon by both combatants, and the blood was flowing freely on both sides. Ultimately, the Superstar reached down deeper than he ever had before, and vanquished a battered Igor. As the Polish strongman lay prone on the mat in the Richmond ring, it signaled the end of the bitterest of feuds. Igor was laughing no more, and the fans were stunned. Superstar was accurate for the most part. 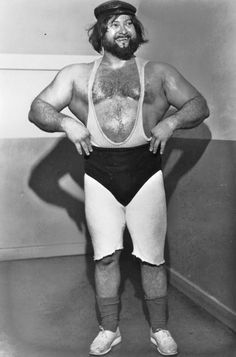 The Mighty Igor, after a short hiatus after the Richmond defeat, returned to the Mid-Atlantic area, but was never a major factor with the promotion again. The Polish strongman had a short and unsuccessful program with Blackjack Mulligan at the tail end of 1977, and then dropped into the middle of the cards before leaving Jim Crockett Promotions for good in March of 1978. After finally dispatching Igor, the Superstar moved on to a heated feud with Paul Jones that lasted into early 1978, though the masked man’s attempt to collect a $10,000.00 bounty on Blackjack Mulligan’s head was probably the more memorable program, that lasted from April until September of 1978. Mulligan unmasked the Superstar in several cage matches that September, doing what Igor could not do a year earlier, and the masked man retreated from Jim Crockett Promotion’s to the Georgia territory. The feud between the Masked Superstar and the Mighty Igor had it all, and was an amazing contrast in styles and personalities. It featured the athletic and cerebral Superstar against the gentle giant, the child-like, Mighty Igor. For me, this feud ran parallel with a memorable time in my life…my last semester in high school, to high school graduation, and into my first semester in college. And the program ended in my wrestling hometown of Richmond, Virginia. So, the feud was quite memorable for me, but nothing like it must have been for the two warriors involved, the Masked Superstar and the Mighty Igor. They had the scars to prove it. And they proved something else…opposites really do attract, but in this case, in the most violent way possible. Ring jacket, replica belt, texas flag, and yellow roses. 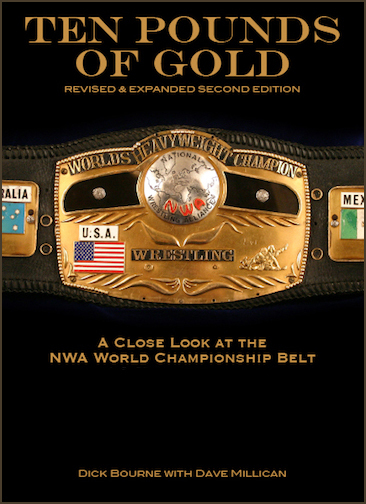 The month of May in 2016 marks the 32 anniversary of the brief NWA world title exchange between Kerry Von Erich and Ric Flair. Kerry won the title on May 6, 1984 at Texas Stadium in Irving, Texas. He dropped the title back to Flair in Yokosuka, Japan on May 24, 1984. Kerry's victory was at the "Parade of Champions" show that honored Kerry's brother David, who had passed away earlier that same year. The photograph above contains several iconic elements, not the least of which is the original ring jacket Kerry wore in the ring the day he won the title. 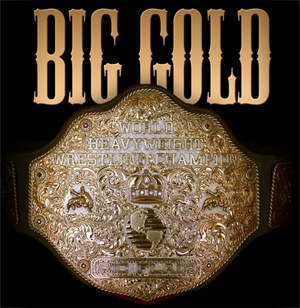 The belt is a Dave Millican replica of the National Wrestling Alliance world championship belt, affectionately known as the "domed globe" or "the ten pounds of gold." 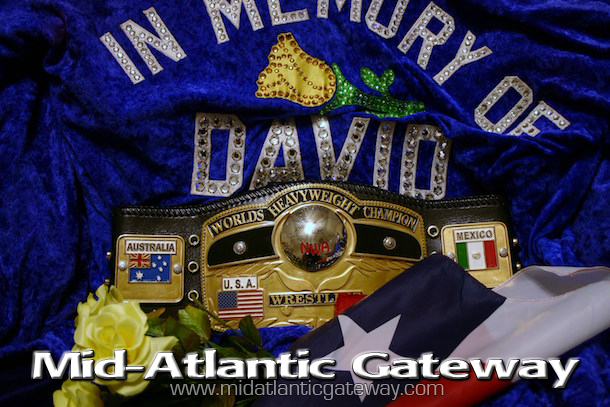 The belt and jacket are adorned with the Texas flag and yellow roses, all of which call back to that memorable and emotional day in Texas Stadium. What a great line-up the Crockett Foundation has as its "tag team partners!" Tommy Young, Baby Doll, Ricky Steamboat, the Rock & Roll Express, James J. Dillon, and the legendary voice of Mid-Atlantic Wrestling Bob Caudle! Some very cool wrestling gear is on sale there, proceeds from which support the good work of the Crockett Foundation. David Crockett and JCP lawyers were demanding the Masked Superstar present a doctor's note as to why he couldn't wrestle the Mighty Igor. 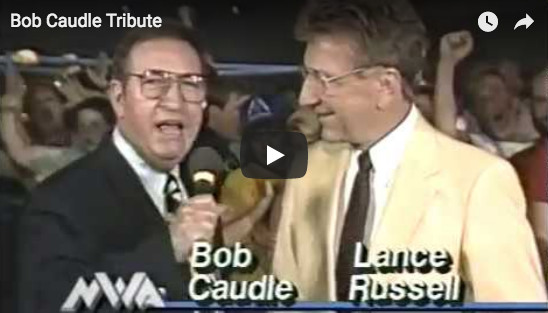 Later on the same TV show, announcer Bob Caudle spoke to Igor about the earlier segment involving the Superstar. Igor said, “Mr. Crockett was kind enough to get lawyers to make him show certificate… blueprint. He don’t wanna show it because there’s nothing wrong with his leg, you see. He’s afraid of Igor and I’ve been chasing him all this time. But I must thank Crockett, Mr. Crockett, thank you very much! Because this way he’s got to show his face to wrestle Igor! No more runnin’ away from Igor…the kielbasa is good! And I feel good ‘cause Mr. Crockett really helped me! !” Igor then started lavishing kisses on Bob Caudle before the announcer could escape the affection of the Polish strongman! What happens now that the Superstar has been forced to sign the contract? Stay tuned as the Masked Superstar / Might Igor saga continues in Part 4! 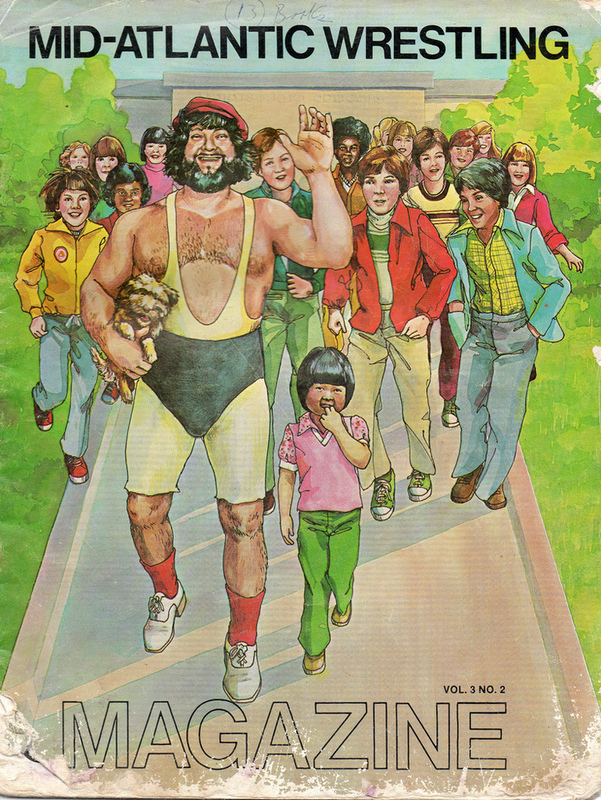 Take a look at the great line-up of 1-hour wrestling programs (remember them?) 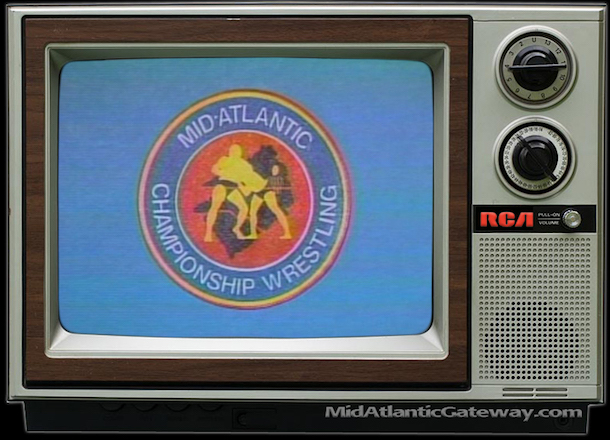 airing on local stations across the Mid-Atlantic area in December of 1973. A look at Harley Race and Bruiser Brody on the set of "All-Star Wrestling" with host Ric Stewart in the mid-1980s. 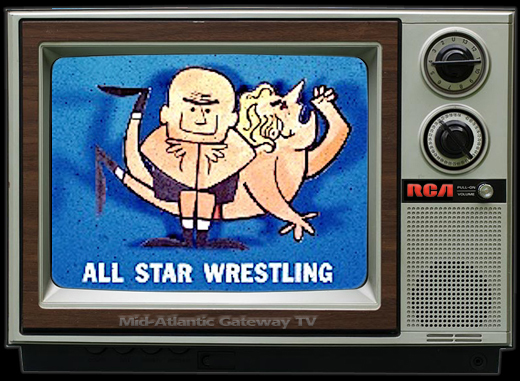 The great series from Wrestling Revue magazine continues with a look at the host of wrestling on TV in Macon and Columbus GA in the 1960s and 1970s. 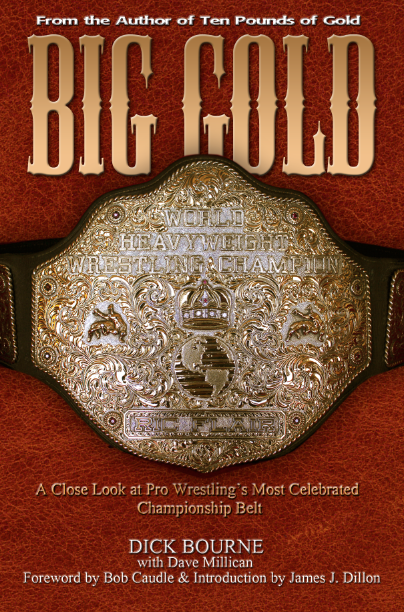 Great shots of great champions with the "ten pounds of gold" including Dusty Rhodes as well as a Japanese poster collage featuring Harley Race, Jack Brisco, Giant Baba, and Ric Flair. Stay Tuned for Part 3 of the re-telling of the Masked Superstar/Might Igor saga which will be up on Wednesday May 18! Cleveland has a Billy Vessels statue, a hometown monument to Oklahoma’s first Heisman Trophy winner. When you get off the turnpike in Miami you drive onto Steve Owens Boulevard, a tribute to its hometown Heisman winner and NFL star. Danny Hodge, considered by many to be the greatest collegiate wrestler in history, will be honored with a statue in his hometown of Perry this week. 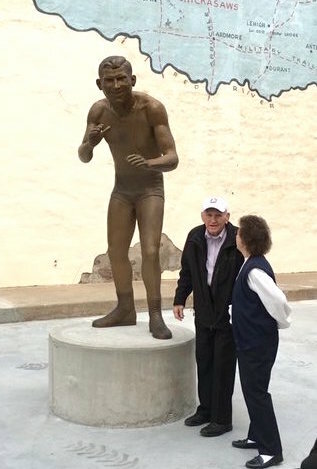 A statue of Hodge will be unveiled at 10 a.m. Saturday, the day after his 84th birthday, in a new park dedicated to Perry wrestling. 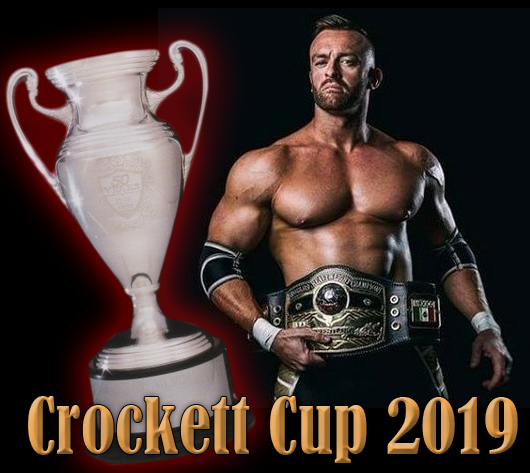 The celebration will be attended by many Oklahoma wrestling stars, including Oklahoma State coach John Smith, Oklahoma coach Mark Cody and dozens of former wrestling champions from around the state. After the Masked Superstar's suspension was lifted, Igor tore into the Superstar on television and ripped his mask off, though with some quick thinking the masked man was able to preserve the secret of his identity. During the month of April, Igor and the Superstar met in the ring, but normally as part of action packed tag team and six-man tag team bouts that included Malenko and Kim Duk on the Superstar’s side. In many of these matches, Superstar would avoid getting into the ring with Igor at all costs. 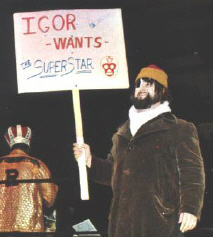 During the month of May 1977, Igor and Superstar continued to battle in specialty tag team bouts, such as elimination matches and Texas Tornado matches. 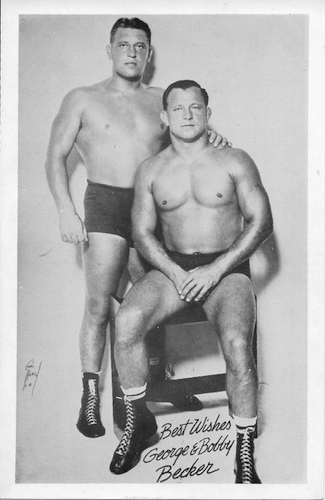 The Mid-Atlantic Heavyweight Champion Wahoo McDaniel was Igor’s most consistent tag team partner at this time. 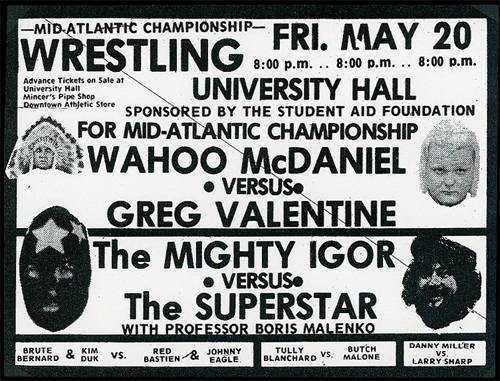 There were also a few singles matches between these two in May, including ferocious battles in Roanoke, Virginia on May 6th, Savannah, Georgia on May 8th and in Charlottesville, Virginia at the University Hall on May 20th. Can the Crockett's lawyers force the Masked Superstar to wrestle? Stay tuned for the answer and much more to come in PART THREE! Any "greatest ever" debate is always influenced by personal preferences of what kind of wrestling you like, where you grew up, when you grew up, what wrestling you first saw, etc. Everyone has their own opinion and can make an argument as to why they feel a certain feud (or match or wrestler) was "the greatest." 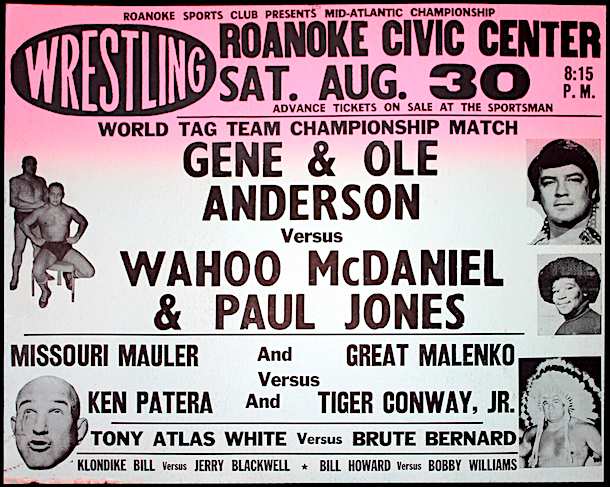 So if my opinion is just as valid as anyone else's, then I submit to you that the greatest tag team feud in Mid-Atlantic Wrestling history was Wahoo McDaniel and Paul Jones vs. the Anderson Brothers. 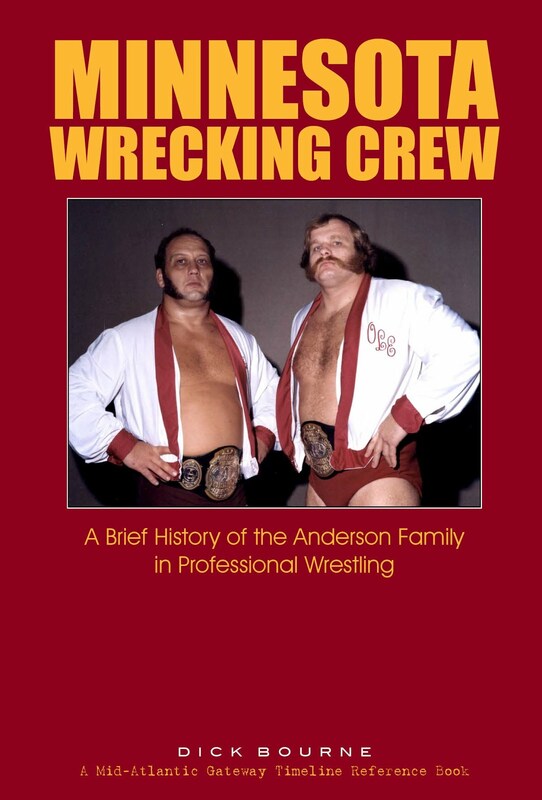 The angle that ignited the feud is one of the most famous in Mid-Atlantic Wrestling history - - the "Supreme Sacrifice" - - where Ole Anderson sacrificed his brother in the match where they regained the World tag team titles on TV. I've written many times before that this was the angle that got me hooked on wrestling and I never missed a Mid-Atlantic or World Wide TV show if I could help it for over a decade afterwards. You might disagree that it was the greatest feud in Mid-Atlantic history. My good friend Carroll Hall would likely argue with me day and night that Johnny Weaver and George Becker vs. Rip Hawk and Swede Hanson should get that honor. I certainly can see how he would feel that way. That was the definitive tag feud of the 1960s. Others might argue for the Andersons vs. Flair and Valentine in the 1970s. 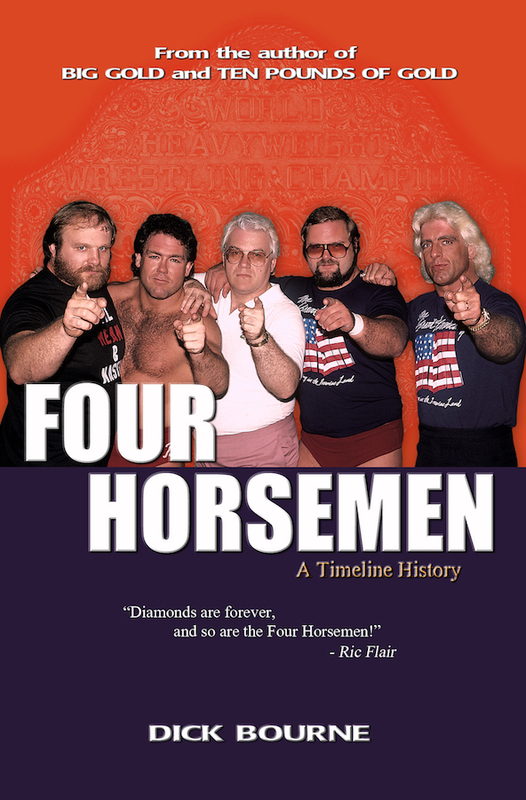 The early 1980s featured two amazing feuds between Steamboat and Youngblood vs. the teams of Slaughter and Kernodle as well as the Brisco Brothers. And a few years later the Rock and Roll Express vs. the Midnight Express defined tag team wrestling for a generation. I love each and every one of those choices. But for me it just could not get any better than Wahoo and Paul vs. the Andersons. It may have not had the longevity of the Weaver/Becker feuds, and it was before the national TV and PPV exposure of the 1980's feuds. But no feud featured tougher, longer, more realistic matches that were any harder fought, or that focused on the who was the best and who would carry those tag team belts. It was personal. And I loved every bit of it. But as the saying goes, that's just my two cents. Your mileage may vary. Forty years ago today - - May 7, 1976. 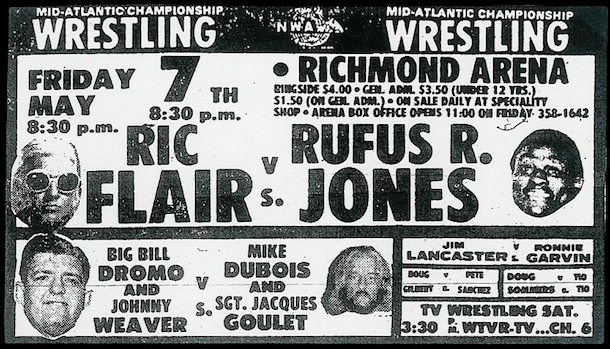 There was no hotter feud in Mid-Atlantic Wrestling at this time than Ric Flair vs. Rufus R. Jones. The "Nature Boy" vs. "The Freight Train." Ric jokes a lot today on his podcast about wrestling Rufus when Ric was NWA world champion, and the crowds being less than excited for those one hour draws in Kansas City. That was in the mid-1980s and Bob Geigel would bring Ric to town and there was no angle other than the fact Rufus was named #1 contender for the world title. And let's face it - - Rufus didn't have much credibility in those days as a number one contender for the world title. There was very little heat on those matches in the mid-1980s. But in 1976, Ric Flair and his cousins jumped Rufus on television and put a chauffeur's cap on his head in a racially charged angle that couldn't happen today. 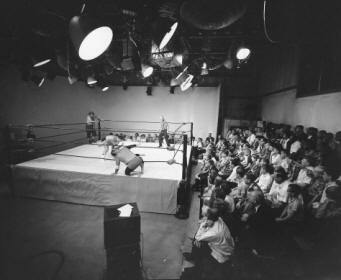 But it was a different era then and promoters and wrestlers often used race to draw houses. Flair and Rufus feuded over the Mid-Atlantic TV title, and Rufus R. Jones was over like rover and one of the top babyfaces in the territory. Rufus, the Andersons, and Flair all took this angle to the bank. And it was white hot heat. As a Pastor for over 15 years now I can say that I have had many inspirations for Messages over the years. Certainly headlines from the world over can create a thought. Personal conflicts in my own life or the lives of those around me can place a spiritual mindset that allows a direction toward a certain Passage of Scripture which in turn develops a new sermon or even sermon series. However, I can also say that my involvement in and around the professional wrestling business has had much to offer me in ways of presentation, illustrations, and even wording at times. I cannot honestly say, in the over 500 sermons that I have written, how many times I have used the phrase "if you will" thanks Dusty Rhodes. Over the years there have been a few “that’s the bottom line" and yes, even a "Woooo!" So as you can see, being a longtime fan of pro wrestling, as well as having been blessed to be involved and even greater, make friends in the business, it has impacted my ministry in a very personal way. One might not normally connect wrestling and preaching, but for me it has become a very typical process. I mean Tully Blanchard, Nikita Koloff, Ted DiBiase, and George South, just to name a few, have all spoken in my churches over the years. As I listened to these words I got the Message. It was clear: when dealing with the devil we find that indeed he has no conscience and will go to any length to create havoc in our lives. Whether turning Hank on to heroin or helping John Denver fly a plane, selling shotgun shells to Kurt Cobain or yes, even breaking Wahoo’s leg, (all the works of the devil outlined in this song) we can see that this enemy we face does not care about who he hurts or what he has to do in order to bring pain to our lives. 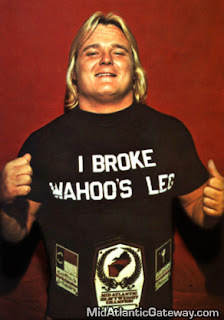 I have never forgotten that Saturday morning when I witnessed the dastardly Greg “the Hammer” Valentine break the leg of my childhood hero, Wahoo McDaniel. Growing up in the era of, what I like to still believe was the greatest pro wrestling ever, those memories are still a very vivid picture in my mind. 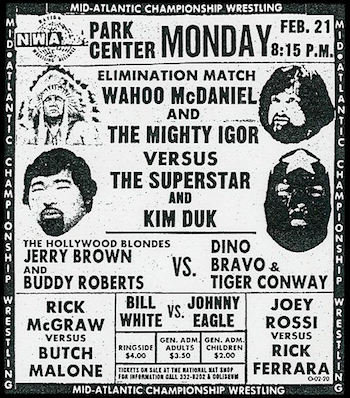 I was looking through some 1985 wrestling results for Jim Crockett Promotions, and it dawned on me that one of the company's biggest events that March followed only one day after one of the company's biggest calamities, the fire at the Crockett ballpark. On Saturday March 16, the Greensboro Coliseum hosted a huge event that celebrated the 25th anniversary of the Greensboro Coliseum dubbed "Silver Star '85." 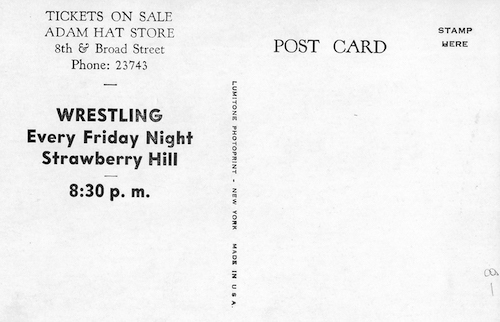 It was also part of a slate of events that would celebrate the 50th anniversary of Jim Crockett Promotions that year. "Silver Starr" was a name born from the creative mind of booker Dusty Rhodes, who had also come up with the name of the company's very successful annual Thanksgiving event called "Starrcade," which had just concluded its second big year. I've always thought, too, that Dusty just liked the imagery of a silver star, perhaps like an old western Sheriff's badge, pinned over his heart. Dusty was, after all, the modern day John Wayne. In the ad at right, "Star" is spelled with only one "R", but in some television advertising, it was spelled with two of them - - SilverStarr - - to mirror the branding of the "Starrcade" name, I suppose. I really loved that stuff. 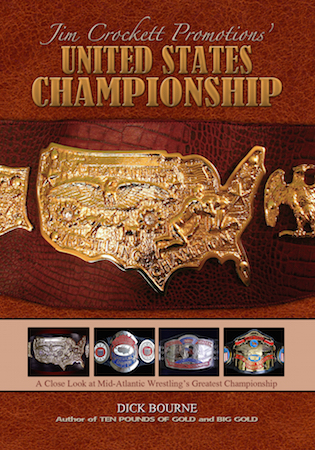 The show was loaded top to bottom, headlined by an NWA world title defense as Ric Flair defended the "ten pounds of gold" against U.S. champion Chief Wahoo McDaniel in an "Indian strap match," which was Wahoo's specialty. The traditional roles were reversed for these two during this time: Flair was a huge babyface in our area (but nowhere else) and Wahoo was now a hated heel. Those roles would reverse again later in this year in 1985. Another big event, and one of the big draws of this show, was Dusty Rhodes challenging Tully Blanchard for the TV title, with Tully's "Perfect 10" Baby Doll locked inside a steel cage that would be hung high over the ring. The added stipulation was that if Dusty lost, he would "leave town" and never wrestle in Greensboro again. 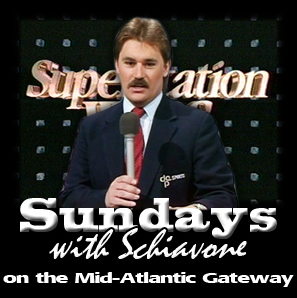 The third main event played off the patriotism of the era where Magnum T.A. and Don Kernodle were scheduled to be joined by the returning Sgt. Slaughter to face the Russian team of Ivan and Nikita Koloff and Krusher Khrushchev in a flag vs. flag match. Slaughter had been one of the top stars in the company as a heel in 1981-1983, and had turned good-guy in the WWF in 1984 in a high profile angle with the Iron Sheik. But Sarge and the WWF had parted ways by the fall of 1984 over issues related to Sarge's outside deal with the G.I. Joe toy franchise. He was now headlining for the AWA and for "Pro Wrestling USA", a promotion that was trying to run shows with combined talent from the AWA and several NWA promotions in hopes of competing with the WWF in the Northeast states. In the Mid-Atlantic area story, Sarge was recruited by his former tag team partner Don Kernodle to aid him in his battle with the Russians. So as you can see, it was a huge event, one of the biggest of the year, and the company was enjoying a surge of interest generally as Dusty Rhodes' booking and Crockett's talent acquisitions were just beginning to take off. But the enthusiasm of this event was blunted by the tragedy of the Crockett baseball park fire that happened just the night before. Jim Crockett Promotions not only was one of the most successful wrestling promotions in the country, but their AA Baseball franchise, the Charlotte O's, was one of the more successful baseball clubs in the AA minor league system. The team was run by Frances Crockett, who had been named Southern League Executive of the Year in 1980. They were coming off a league championship the year before. 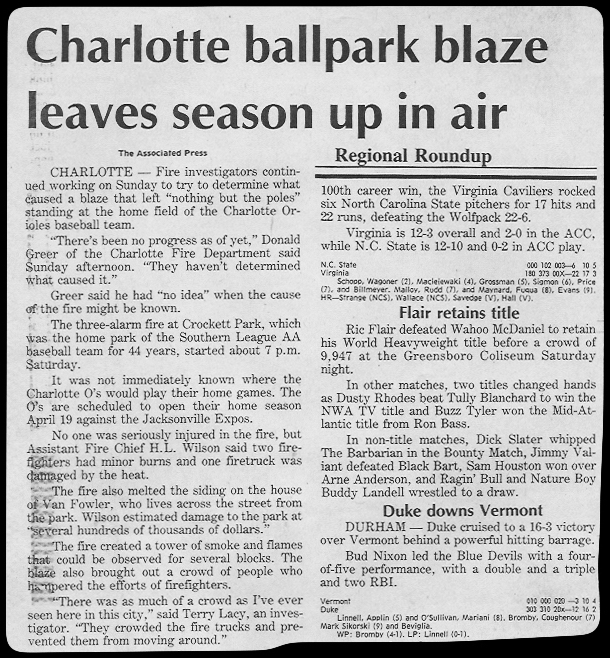 Their home was Jim Crockett, Sr. Memorial Park, a classic old wooden structure that had been home to minor league baseball in Charlotte for over 40 years. And in recent years, a it had hosted a fair number of wrestling cards, too. Investigations later indicated that the fire was a result of arson following a high school baseball game played there earlier (Wikipedia). 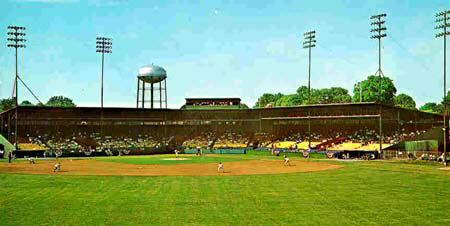 The Crocketts quickly built a makeshift stadium where the team played for the next several years, but business was dramatically impacted by the fire and eventually the team was sold in 1987. So a weekend that should have been full of celebration for the Crockett family was certainly marred by the fire that completely destroyed their home ballpark. Not only that, but according to France's daughter, the storage area at the park housed a lot of Crockett family memorabilia that was also destroyed in the fire. It was definitely a weekend of highs and lows for the Crockett family in March of 1985, as represented in the newspaper clippings above. The company's baseball business would fade after the sad events of the ballpark fire, but the wrestling business was just getting ready to catch fire once again, at least in a metaphorical sense, in a very big way. I always thought this show was somewhat underrated considering the lineup. 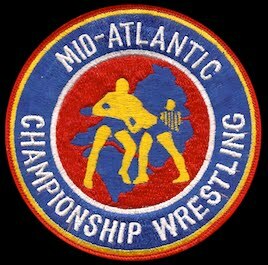 It deserves more recognition for being a major part of the changing of the times in Mid-Atlantic Wrestling. A busy month in JCP as the Koloffs would win the NWA tag straps two nights later on Monday, March 18 in Fayetteville and the following Saturday -- March 23 -- in Charlotte, Magnum TA would win the US title from Wahoo. Late Note: Despite some reports of Sgt. Slaughter not being at this show, we have since confirmed that he was. I was able to confirm that with Don Kernodle recently, and also received a nice email from Joshua Jenkins who attended the show that night in Greensboro. 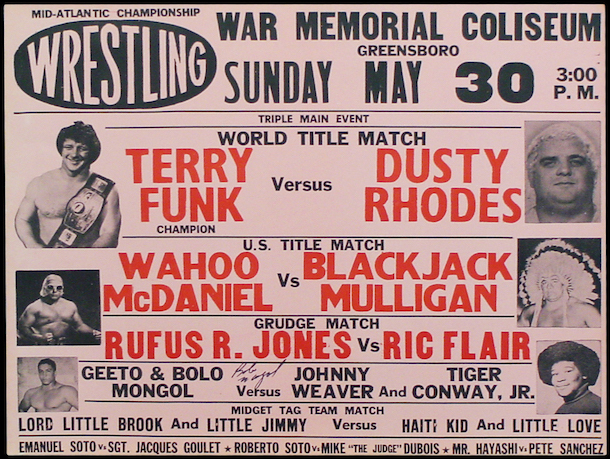 A flashback to this month 40 years ago, a big card at the Greensboro Coliseum, headlined by Terry Funk defending the NWA world title against the "American Dream" Dusty Rhodes. In July of 1974, a masked newcomer calling himself the Avenger arrived in the Mid-Atlantic area. A bit undersized but in fabulous condition, the fans took an immediate liking to the new guy in town. At that time, the masked Super Destroyer was running roughshod in the territory. In his early interviews, the Avenger told the fans that the Destroyer had injured him in another area, and that he had come to Jim Crockett Promotions to get his revenge by taking the mask off of the Destroyer. From Thanksgiving of 1974 until the end of March 1975, the Avenger and the Destroyer engaged in a very entertaining program. The Super Destroyer’s vaunted claw hold had limited effectiveness against his masked opponent, as the Super D. had great trouble gripping the Avenger’s head because of the slick mask covering the Avenger’s face. The feud between the masked grapplers had its climax in mask vs. mask bouts in the territory’s larger cities in March of 1975, where the Destroyer prevailed after a series of brutal battles. After coming out on the short end against the Super Destroyer, and after many fans saw him unmasked, the Avenger slipped into mid-card matches. Promos and interviews were never a real strong suit for the Avenger, and when he was no longer wrestling in main event matches, the necessity for him to be on the mic was no longer present. Though he continued to wrestle in the Mid-Atlantic area into November of 1975, the Avenger’s last TV interview was on May 21, 1975. To me, the Avenger’s very best interview was his last one! This time, a suddenly fired up Avenger interrupted the big bully, Ole Anderson! The Avenger exclaimed, “Now wait a minute!” Ole dismissively countered, “You still here? Get out of here! !” The Avenger, now fully engaged, fired back, “You talkin’ about competition; you talkin’ about competition?” Ole smirking, said, “Yeah!” To which the Avenger replied, “Why don’t you wrestle me sometime? You’ve never wrestled me! Why don’t you wrestle me sometime?" Ole was livid! Foaming at the mouth, Ole wailed, “WHAT??? PAUL JONES??? You bring this Jones out here…you can’t have Jones!! For what, to wrestle us… next week? You’re out of your mind! !” Even the normally silent partner Gene Anderson could be heard yelling in the background about the choice of Paul Jones! Gene and Ole were rightly upset about having to wrestle Paul Jones, as he was partly responsible for taking away their World Tag Team Titles a few days earlier. The Avenger used what would turn out to be his final Mid-Atlantic interview to put the “Minnesota Wrecking Crew” in their place. The match itself the following week was anti-climactic, as the Avenger was not able to use the bout against the Anderson’s as a springboard to get himself back into main event matches. 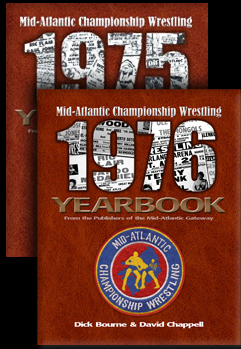 Instead, the masked man continued slipping down the cards into preliminary matches before his exit from Mid-Atlantic Championship Wrestling in November of 1975. I can remember to this day how the “never mind” responses from the Avenger were the talk of my circle of 10th grade wrestling friends at the time, to the point that any question to any of them had the distinct possibility of being answered with a “never mind,” followed by a big smile, all the way to the end of that school year! Never one for a doing a great promo, the masked Avenger managed to participate in a memorable one in his last interview, when he stood up to the bellicose Ole Anderson! Yes, I think the Avenger saved his best for last. And if you don’t think so, well, as the masked Avenger would say…never mind! Photos of the Avenger on this post were provided by photographer Bill Janosik.